It's the day after Christmas 2011 and I've just started using my new GLO system. This was the one gift I was really hoping to see under the tree and it was! You might have heard about it from Doctor Oz, or even on HSN, but I don't watch either of those. I'd first seen it in magazines, and then while shopping in JC Penny of all places, they had a new Sephora section with a large GLO display. That's where I showed my husband and planted the seed. I charged it up Christmas night, and the next night, once the kiddo was in bed and I had time alone, I started with my first 4 treatments. 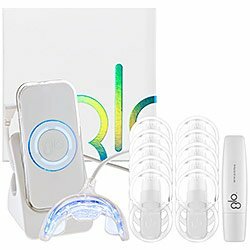 "The GLO Brilliant Personal Teeth Whitening Device reinvents the experience of teeth whitening using patent pending G.L.O. (Guided light optic) technology, combining professional elements of heat and light built into a one of a kind- closed system mouthpiece to accelerate the whitening process. The mouthpiece prevents the whitening oxygens from escaping the tooth surface, making the process more effective and more efficient. Used with our innovative, whitening Gel G-Vials that contain a thixotropic formula which adheres to your teeth without getting on gums and other soft tissue, this avoids the problems of sensitivity common with other whtiening methods. Created by renowned aesthetic dentist Dr. Jonathan B. Levine, this sleek, hands free, take-anywhere device is truly radical and unique." Charge the controller for about 4 hours. You'll know it's ready when all three parts of the circle light up. When it's fully charged, and you have a 40 minute chunk of time ahead of you, plug your mouthpiece into the controller. You can hang the device around your neck like a necklace which makes this hands free while it's working to make your smile whiter. Next, apply the special lip balm. Open a vial of whitening gel, squeeze it up into the bristle top and apply it to your top and bottom teeth. Insert the mouthpiece and turn it on. After 8 minutes the controller lights will blink, and then it will shut off automatically. I like to write down my start and stop time too. The control doesn't make a sound, it only blinks, so you might miss it if you aren't keeping track. Once it shuts off just spit out any excess, rinse the mouthpiece in warm water and do it again. The process takes 4 eight-minute sessions in a row, per day. 5 days in a row is what is recommended, but they give you enough gel for 10 days (40 applications). Oh, and make sure to keep the gel in your refrigerator while not being used. If you don't empty out a G-Vial in one sitting put it back in the fridge for the next day. They say you get 4 doses per vial, but I got 7 out of mine. 12.26.11 I took photos of my teeth before starting and plan to continue after each treatment. I'm hoping to see whiter teeth of course. Fingers crossed this works! I'll let you know if and when I can see any difference, and will post pictures too. Will I start off the New Year with a new smile? 12.27.11 Saying hello while I'm sitting here during my second day of GLOing. I just took the second round of pics for my comparison. There was no noticeable difference after the first night of use. I wasn't really expecting any yet so I'm not disappointed. 12.29.11 I just added last night's picture below. I decided to give my mouth a break for tonight so I won't be using my GLO. I woke up with some blisters behind my upper lip so I want them to get better before I continue. It's probably from the light. This is typical 'me'. If something can go wrong it will. I'm lucky like that. On my off night I'll be adding my responses to some of the negative reviews I've read online today. 12.30.11 One more night off. I plan to start again tomorrow night. I'll be posting at least two more photos. 12.31.11 My mouth is 100% better so I went ahead and did treatment #4 today. Took pictures after and I added it to the group below. I was hoping to see more change by now, but I'm not giving up. 1.1.11 Finished my first 5 treatments. I'm not seeing much difference from the day before. Maybe my stubborn teeth need a full 10 days? I've been reading through some online reviews of GLO Brilliant and finding lots of complaints that I don't agree with. I thought I'd address them here. Not enough gel in the vial for 4 applications. I find that really hard to believe. Unless you try to cover all of your teeth at all angles, instead of the fronts of the teeth that show when you smile like instructed, you will have more than enough. I had enough for 7 applications with my first vial. You need to keep the gel refrigerated. I haven't had a problem with messy or runny liquid. The gel is thick and is easy to apply. You have to charge it before the first use. Plug it in and when it's ready the blue lights will turn off. When in use it will automatically shut off after 8 minutes letting you know it's time for the next application of gel. If your unit never turns on ask to exchange it. This one was mostly said by people who gave up after one or two days. It takes a minimum of 3-5 consecutive days, and up to 10, to get the best results. I can already see a difference. My teeth have had no sensitivity at all, and neither have my gums or lips. But I did wake up with blisters inside my mouth after my 3rd night of use. It's just in the front top (behind the skin from my top lip to my nose). It's enough to have me take a night off from GLO, but not enough to stop using it altogether. I don't want it to get worse, so it's better to be safe than sorry. This is the only complaint that I can somewhat agree with. For some reason my post didn't show up, so I'll post again since I am now signed up to be a member of wizzley.com I want to see my comments post. I have the Glo system and it does cause some sensitivity at and near the gums (less than other systems though), there is not enough gel to cover the tops of my bottom teeth (which is a bother because you can see that part of my teeth when I talk and smile). After 5 treatments the results are negligible so I don't think it's worth the high price. I have it, bought if off hsn. I don't see a whole lot of a difference after 5 treatments. It does cause a little bit of sensitivity to my gums and the area of my teeth near my gums but I have to say it causes a lot less sensitivity than other products have for me in the past (like strips and the whitening system from my dentist) so the fact that there is LESS sensitivity is a plus. I think it's deceptive to say there is no sensitivity though and I'm BIG on honesty in advertising. I agree with all the other reviewers that there is not enough gel in the vial. Not nearly enough to cover the tops of the front teeth on my bottom teeth (and that part of my teeth can been seen and needs to be included in my whitening treatments. There is a negligible difference in the color of my teeth before I started whitening. Considering how pricey it was, it's not worth it. I wish I could return it but I am past the 30 day guarantee period hsn offers. I think I'll pass on this. I don't want blisters in my mouth. Thanks for the review. Your teeth already look pretty white to me. This is a really cool product, so happy to hear about it and to follow as you experience first hand the results. Thanks for the product review as white teeth is something we all want and without paying the pricey expense of the dentist services. Can't wait for the final results. Keeping my fingers crossed for you! Good luck! Looking forward to see how it works with you! Good luck on this, Christene! What a great idea for a page - charting your actual daily use of the product - be fascinating to see how it turns out! Keep us posted of your progress. I would love to see if this actually works! Do you feel the need to wear makeup, are you uncomfortable being seen without your makeup on? Makeup is not who you are, learn to be free from the need to wear makeup.